Hope you were lucky enough to receive a box of fresh pears or oranges as a holiday gift. My brother and his wife, “Jo” and Anne Collier, sent us a box of Comice pears from a Texas fruit grower, Pittman & Davis. These pears are so sweet and juicy you have to stand over the sink when you bite into one, ‘cause the juice is going to run down your chin for sure. We ate most of them sliced and unadorned, but I did save a few to put into a green salad we served alongside roasted turkey and Brussels sprouts. Toss what you like into the salad mix. Everything tastes good with the sweet pears. Serves 4 to 6. Adapted recipe is from Pittman & Davis. Make the salad dressing by combining the lime juice, paprika, lemon rind, mustard, honey, salt, Tabasco, pepper and oil in a small bowl. Whisk until thoroughly mixed. Peel, deseed and slice pears. Arrange salad greens in a bowl, top with sliced pears, roasted nuts (if desired), cheese, broccoli florets and carrots. 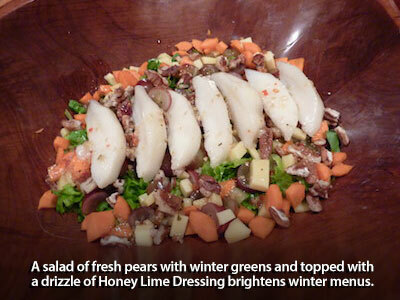 Drizzle Honey Lime Dressing over the salad and serve.